The name "Toft" is derived from an old Viking word meaning "curtilage" or "homestead". The ancient parish of Toft consisted of 1285 acres between the villages of Comberton to the east and Caldecote to the west. At the time of the Domesday Book the parish extended up to the Cambridge to St Neot's road, and thus included modern-day Hardwick until it became a separate parish. The village probably sprang up during Saxon times, when the wooded area began to be cleared for farming. By the time of the Norman Conquest the lands were owned by the king, the Abbot of Ely, and a woman named Eddeva. The Normans gave Eddeva's lands to Alan, Count of Brittany, who passed them to the manor of Swavesey. By 1109, the lands were all granted to the newly formed Bishopric of Ely. Toft has 23 listed buildings of special architectural or historic interest. Among these is Toft Manor, formerly the Rectory, which was built in 1844 with several cottages. Toft is a small village based in the South West of Cambridgeshire, approximately 6 miles from the City of Cambridge. The parish is intersected by the Greenwich Meridian. In the 2001 Census, Toft had 219 households and a population of 583. 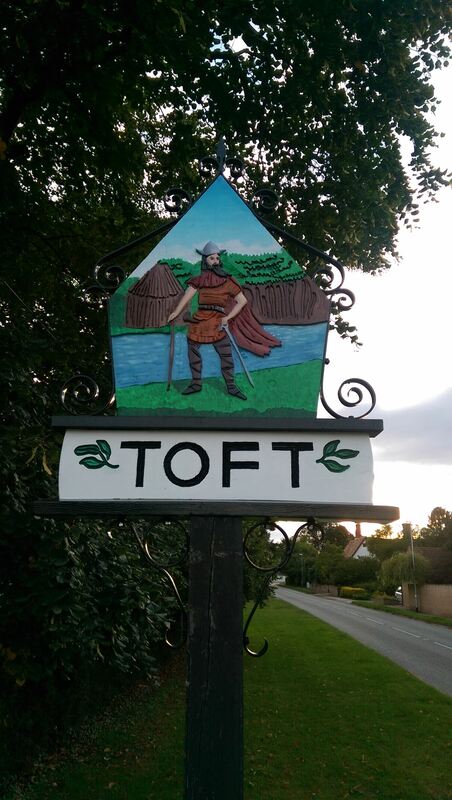 The name "Toft" is derived from an old Viking word meaning "curtilage" or "homestead". Toft was listed in the Domesday Book of 1086 (as Tofth), then having a population of about 193. Toft has two churches, St Andrews' Parish Church and the Methodist Church, which under a covenant between the two, means they are collectively called "the Church in Toft", sharing both social and religious events for the community. The cache is very near the village sign but NOT on it so please do not go climbing all over the sign!